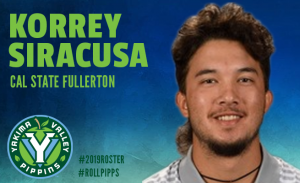 YAKIMA, Wash. – Three freshmen from perennial Division I power Cal State Fullerton – infielder Zach Lew, right-handed pitcher Joe Magrisi, and catcher Korrey Siracusa – are the newest additions to the 2019 Yakima Valley Pippins, head coach Marcus McKimmy announced Tuesday. Magrisi, a 6-foot-2, 210-pound right-handed pitcher, is also in his first year at Fullerton as a hard-throwing bullpen piece. The San Diego, California, native was ranked the 10th-best freshman in the Big West Conference by Baseball America entering the 2019 season. 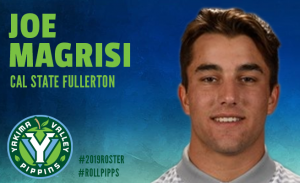 At Torrey Pines High School in San Diego, Magrisi went 12–0 with a 0.75 ERA and 130 strikeouts in 93 innings as a senior, while only walking 12 batters. For his efforts, he was named Prep Baseball Report State Pitcher of the Year, League Pitcher of the Year, and San Diego CIF Player of the Year. Additionally, Magrisi broke 21-year Major League veteran and 3-time All-Star David Wells’ San Diego high school record for consecutive scoreless innings when he pitched 54.2 straight frames unblemished. 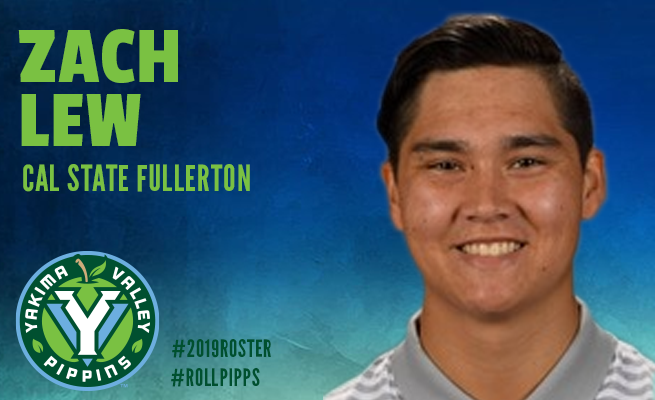 “He is throwing out of the bullpen at Fullerton now, so he will be fresh and motivated to impress when he arrives in Yakima in June,” said McKimmy.